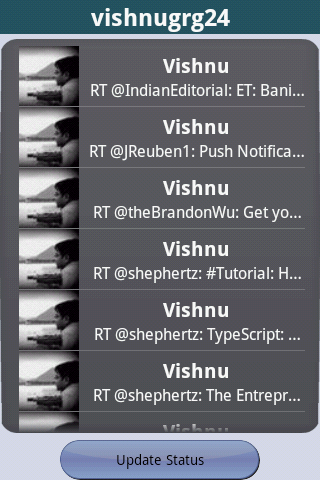 Among one thousand and one ways to push the graph of social engagement, we suggest integration of Twitter on Android. 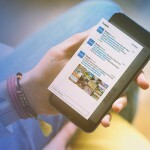 Considering its tremendous success, we have demonstrated below on how can your App be easily integrated with Twitter. Moreover, the sample also uses App42 Social Service API. A. Change CONSUMER_KEY with your Consumer key from step 5 at line no 7. B. Change CONSUMER_SECRET with your Consumer secret from step 5 at line no 8. C. Change API_KEY and SECRET_KEY that you have received in step 7 or 8 at line number 10 and 11.. 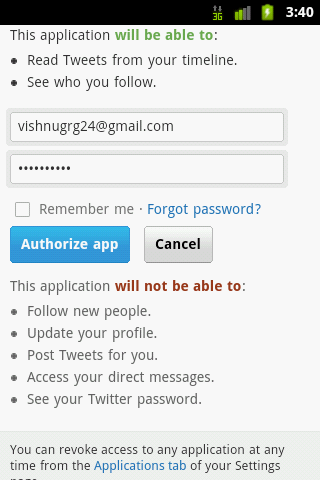 Authorization With Twitter : To use Twitter API in your android application, you have to authorize the App. As a sample, I have authorized my application in TwitterApp.java file. 1. We require CONSUMER_KEY and CONSUMER_SECRET here. 2. Once your application is authorized , you can use Twitter API directly. Handle Authorization callback: After you have authorized, you have to handle callback and save authorization details so that it doesn’t ask you for details again and again. This is done in TwitterApp.java file. 1. Here, we get Accesstoken that shows that authorization is done. 2. Using this AccessToken, we will get our authToken, authTokenSecert and screenName. We will save these details. Load Tweet-list: Following method is used to load the user Tweets only if the user is authorized. It takes authToken, authTokenSecert as an argument that are saved in Shared Preferences of android device. This is written in TwitterService.java file. Build Tweet-list: The function mentioned below makes the Tweet-list along with the desired Tweet information. This function is written in TwitterService.java file. 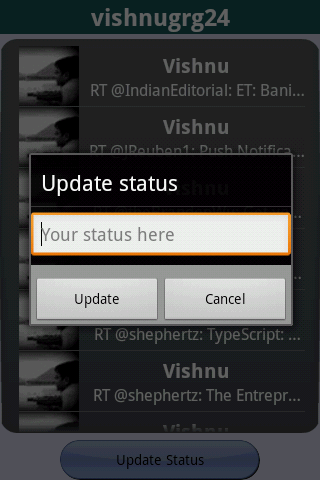 we can easily update our Twitter Status. This is written in TwitterService.java file. If you have questions or need any further assistance, do write to us at support@shephertz.com.